Narrative: The Atlantic Rebekah Lodge, No. 52 was instituted 16 April 1909 in Bridgewater. Members met in the I.O.O.F. LaHave Lodge building in Bridgewater. They also met in the Masonic Temple for a while on Pleasant Street. Later moved to King Street building until this building was destroyed by fire in 1950 where they lost all of their early records. The Rebekah’s hosted their Grand Lodge in Bridgewater in 1923, 1938 and 1948. Eventually the Bridgewater Rebekah’s branch did not have enough members to continue, so they merged with the West Dublin Rebekah’s in 2015. Description: Small framed ivory coloured handwritten certificate, mounted behind glass and in a wood frame. 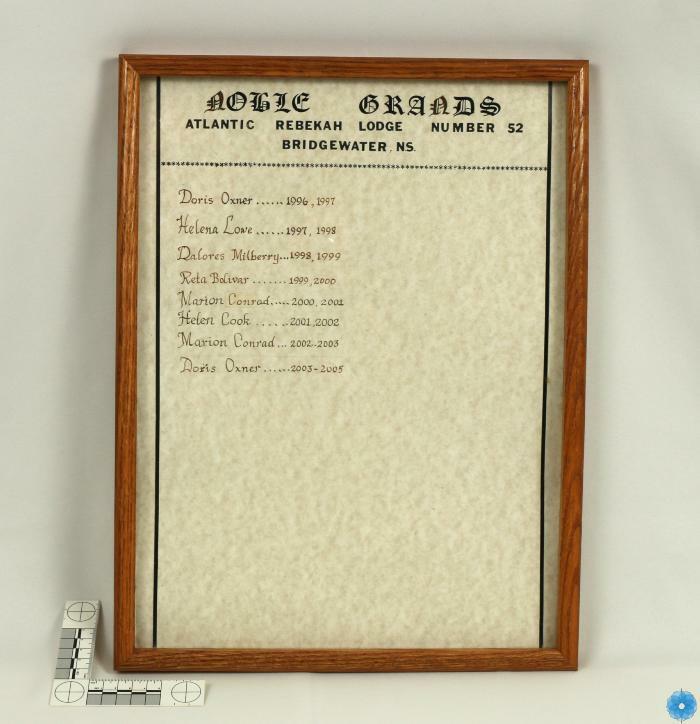 Lists the Noble Grands members of the Atlantic Rebekah Lodge, No. 52, Bridgewater, N.S. from 1996 to 2005. History of Use: Created to document the names of Noble Grands members of the Rebekah Lodge.